Here is a real artist contemplating his drawing at one of those spots specially assigned to painters and caricaturists along Las Ramblas, Barcelona. Nothing like the pleasure of staring at your work with the satisfaction of having created something you feel proud of. It happens with almost everything in life, and certainly, we are here because we like to create stuff and have goals that make us find a place as individuals in society. Of course you create for yourself but you need some recognition for your creation to be valuable. Being an artist many times depends on just that, good reviews. Although, then, there's the real artist, the one with the gift, like, Mozart for example, people that are great simply because they are, and the only thing you can do about it is bow and worship in awe. In other words, there are gifted souls and the rest of mortals. Within the latter, you've got, individuals that try real hard, and come out with a remarkable result and then there is the mediocre kind, divided into those who accept they are and those who regard themselves as artists. Do what you do, your work is of course respectable because is yours but don't expect everybody to like it. But beware of critics that may be part of that mediocre bunch and their snobbish ways, because sometimes genuine art is judged by shortsighted minds and they are really harmful. Beautiful portrait of the artist at work. 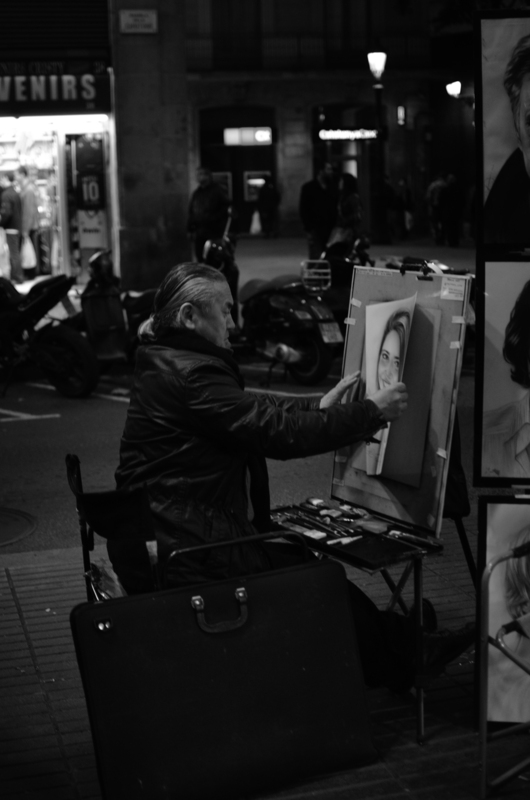 Barcelona is filled to the rim with fabulous artists and you can see so many of a very wide variety on Las Ramblas.